When thousands of Palestinians rallied for freedom this past weekend, Benjamin Netanyahu’s response was not to stand by their ‘freedom’. Almost a month ago, Israeli Prime Minister, Benjamin Netanyahu, tweeted to show solidarity with the Iranian women protesting against Iran’s hijab laws, mentioning that he stands by those who stand for ‘freedom’. As we counter Iran’s aggression, we should always remember the brave people of Iran: their suffering, their hopes, their courage. Women are jailed for removing their hijabs. Students are tortured and shot for advocating freedom. We stand with those in Iran who stand for freedom. Nikki Haley, Donald Trump’s ambassador to the UN, also said something similar in January of this year when protests began to rock Iran shortly after the beginning of 2018. And yet, when thousands of Palestinians rallied for freedom of their own this past weekend, Israel’s response was not to stand by their ‘freedom’. Instead, it deployed over 100 snipers to the Gaza border, and shot the protesters down in cold blood. Reports have emerged that some 1,400 people were injured, and at least 15 were killed by the Israeli Defence Forces (IDF). The protests, which actually involve young, peaceful and unarmed protesters, represent the 700,000 Palestinians who either fled or were expelled from their homes when Israel first sprang into existence in 1948. They are protesting for the right of return to their land, having been trapped and enclosed in what is widely regarded as an open-air prison, subject to routine bombing by the Israeli military. As of this year, 97% of Gaza’s drinking water has been contaminated by sewage and salt. For most of last year, the residents of Gaza were restricted to barely four hours of electricity in a day. By 2020, the UN has predicted Gaza will become completely uninhabitable. The people of Gaza are clearly crying out for freedom. So what was Netanyahu and Haley’s response this time around? One can only wonder what sort of activities can be justified using this type of logic. Using violence to prevent violence from taking place only makes sense when it becomes clear what is really being discussed here. Namely, this is a “better them than us” scenario, in which it is justifiable in the eyes of the IDF to injure 1,400 Palestinians rather than jeopardise the safety of even one Israeli. At Kuwait’s request, and following UN Secretary General Antonio Guterres’ call for an independent and transparent investigation into Israel’s actions, the UN Security Council held an emergency meeting on Friday, with the aim of issuing a statement condemning Israel’s deadly use of force. The US blocked the statement several times. Apparently, Haley’s role as ambassador to the UN involves convening emergency meetings for protests inside Iran, but the 2 million residents of Gaza do not deserve equal respect and treatment. While the killing of at least 15 protestors and the injuries of another 1,400 might seem like harsh measures, the blunt truth of the matter is that this is just the beginning of something far more sinister. The Trump administration will officially be moving the US embassy in Israel to Jerusalem on May 14, 2018, in order to solidify Trump’s recognition of Jerusalem as Israel’s true capital. 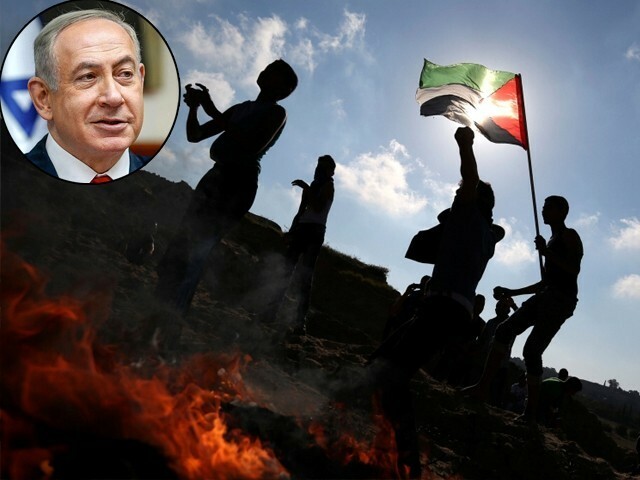 However, the following day (May 15, 2018) is the day the current Palestinian protests are leading up to – known as Nakba Day to the Palestinian people. This day represents the expulsion of 700,000 Palestinian people from their homes as mentioned earlier, and is a highly emotional occasion marked every year by the Palestinians. In turn, Israel has also warned it will expand its response if these border clashes continue at Gaza. Make no mistake – this conflict is only beginning to heat up, and the worse, unfortunately, is yet to come. 10,000 Yemenis have died due to actions of Saudi Arabia. Let me restate this in Religious terms since Pakistanis understand this better – 10,000 Muslims, have been killed in Yemen by Pakistan’s ally. The numbers in Palestine are insignificant. Like Pakistan ignoring the atrocities of China (no blog post has come out asking China to release wives of Pakistanis who were kidnapped by the state) or Saudi Arabia. Both the people of the USA and Israel are not indigenous folks of the lands they have occupied but of nomadic origin and very likely to leave and move on once the heat becomes intolerable. Human rights is not their business. The Palestinian folks need patience like their thousands years old olive trees. the God of Ibrahim knows of their sufferings.